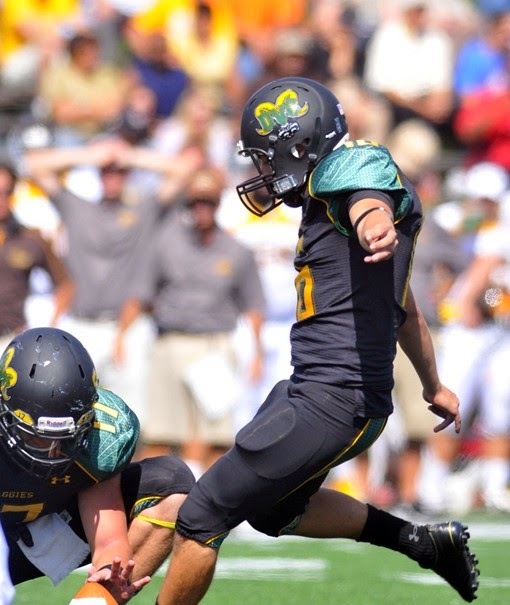 ANNVILLE (PA) – A pair of Delaware Valley College seniors, wide receiver Rasheed Bailey (Philadelphia, PA/Roxborough) and placekicker Brandon Snyder (Shillington, PA/Governor Mifflin), took home week one Middle Atlantic Conference (MAC) accolades for their performances in the Aggies’ 30-20 win at Montclair State University on September 6. Bailey was named the MAC Offensive Player of the Week while Snyder was selected as the conference’s Special Teams Player of the Week. Coming off a 2013 campaign where he was named to the all-MAC first team offense, and selected as a preseason All-American by USA College Football for this season, Bailey answered the bell in the 2014 opener. He hauled in 11 catches for 216 yards and a touchdown in a game that saw him matched up against Montclair State All-American cornerback C.J. Conway for most of the afternoon. The 11 receptions tied him with six other Aggies for the most in a single game while his 216 yards was the fifth-highest, single-game total in school history and moved him into ninth on the all-time list (1,647 yards). Snyder, who also earned all-MAC honors for last season as an honorable mention selection, put together a 12-point effort against the Red Hawks including three made field goals from 19, 27 and 37 yards out. He was also a perfect 3-for-3 in extra-point tries. Delaware Valley got off to a 1-0 start to the 2014 campaign heading into its bye week. The Aggies will kick off conference play at home against Wilkes University on Saturday, September 20.